In the 20 days following the earthquake, MSF surgeons worked around the clock, carrying out over 1,300 surgical operations. Just over one tenth (140) of those operations were amputations, and they were always the last resort in the effort to save the life or limb of the patient. Paul McMaster is a surgeon who reached Haiti less than a week after the earthquake struck. “When we started surgery we didn’t have electricity in the hospital. The team rigged up a couple of lights in a tree. We were working off two makeshift operating tables in the courtyard and we just went from one patient to the next. Those first few days we didn’t have water or food for the patients - or indeed for the teams working. These were brutal wounds. They were deeply infected after three or four days when people were still being brought out. The surgery isn’t very complex, but it’s a very, almost primitive and brutal surgery of removing dead and damaged tissue and amputating limbs. The decision you have to take surgically is whether you can preserve that limb or whether it must be removed. It can be a very difficult decision at times and amputation is clearly the last resort you want to turn to. But when a person has been crushed for days in a building, the tissues have been severely damaged, and the great dangers are overwhelming infection and septic shock setting in. Seven year old Jerry was trapped under the rubble when his house collapsed, and emerged with a severe open fracture to his femur. MSF put Jerry on antibiotics straight away to keep infection at bay and an MSF surgeon performed a complete cleaning of the wound. However, a few days later the doctors discovered that the infection was still raging, and they became extremely concerned that it would spread to the rest of his body and threaten Jerry’s life. “The wound was very near the groin, so if the infection went above it there would have been very little we could have done to save him. We knew we had to amputate if we wanted to keep him alive,“ remembers Dr. Karin Lind. Reconstructive surgery is not just about aesthetics: it can help limit infection and restore mobility. In the days after the earthquake many patients arrived at MSF facilities with drastic loss of tissue, both muscular and cutaneous. To limit the risk of infection and preserve patients’ limbs, the teams administered skin grafts and carried out scar control. In the less severe cases they were able to use a technique that involves taking a piece of skin from a healthy part of the body and applying it to a superficial wound. This allows new skin growth to occur after two or three weeks. For more severe tissue loss or necrotised wounds (notably severe burns), it was necessary to apply reconstructive grafts. Once the acute phase has passed, other techniques are used to restore mobility and physical function. 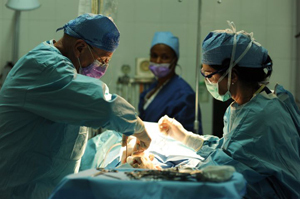 Most of these methods were taught in the University Hospital of Haiti before the earthquake, but many Haitian surgeons were unable to use them due to lack of equipment. Since the earthquake, local MSF teams have worked in partnership with their Haitian colleagues to reintroduce these techniques into the operating theaters, using the new equipment sent into the country. In the future the teams will therefore be better able to deliver patient care to victims of violence, road accidents and burns, who are now replacing earthquake victims in the hospital beds. Overall, some 11,421 patients went through MSF’s rehabilitation programs. Doctor Maria Adele Dammacco, a specialist in reconstructive and aesthetic surgery, joined the emergency teams in Port-Au-Prince in February. “In Port-au-Prince, patients leaving hospital are going to live in very difficult conditions, and the risk of infection is high. Plastic surgery, amongst other things, can reduce the risks. For instance a simple skin graft will allow a superficial wound to close more quickly than if it were left to heal completely by itself. In a situation where tens of thousands of people were injured at the same time, it is a real bonus to be able to make post-operative care easier. For many of the types of injuries sustained during earthquakes, physiotherapy is vital to recovery and rehabilitation. Patients with lower and upper limb fractures and breaks, pelvic trauma and compound fractures all require physiotherapy to ensure they regain as much mobility as possible, recover muscle tone and avoid muscle atrophy. Physiotherapy also helps prevent medical complications such as deep vein thrombosis and pulmonary embolism. Initially MSF, in partnership with Handicap International, was providing post-operative physiotherapy to fresh trauma cases. By the beginning of June the nature of patients’ injuries had changed, so that only about half of cases were directly related to the earthquake - mainly complicated orthopedic issues. The other half were largely due to road accidents and burn injuries. There were few physiotherapy services available in Haiti prior to the earthquake, so finding trained physio staff has been a major challenge. Many auxiliary medical staff had to be trained from scratch. Much of the necessary equipment has been sourced locally: parallel bars, weights and extension machines have all been made with local material. An exercise bike machine was made by simply suspending a normally bicycle by the back wheel. MSF is now providing physiotherapy in a number of inpatient and outpatient facilities, both in Port-au-Prince and other devastated cities such as Leogane. Gilles Lavigne is a physiotherapist who arrived in Haiti a week after the earthquake. “The treatment includes massage, exercise, working on mobility. It’s very important you start treating burn patients very quickly after the accident to prevent muscle shortening. If a patient has had a skin graft you have to massage around the scar to keep the skin elastic. We have brought in special thermo-plastic splints for the treatment of burn victims. The special splints keep the hand or arm in a good position and ensure the scar is able to heal properly. We have to make a unique one for each patient. The earliest forms of this most basic contact between patient and medical professional after the disaster were in the hospital reception units and clinics that dealt with thousands of the more minor injuries. As the MSF presence expanded and the number of facilities increased, these outpatient departments touched on ever wider parts of the city, as well as the towns in the affected area. Mobile clinics went out into the settlements to find people who were not traveling to the hospitals. The primary health care clinic, a familiar model from many countries and refugee camps where MSF works, is important for several reasons. One of the first procedures is a check up when a new patient registers. Weight, height, temperature, blood pressure, a urine test, and nutrition measurements are all taken. This allows MSF to identify major health problems among the communities and monitor for potential disease outbreaks such as measles, meningitis, typhoid and whooping cough. At first, patients were coming with injuries to be dressed, four or five hundred a day to each clinic. Today this number has dropped drastically, down to an average of around 70 a day. Many of the health problems reflect the extremely poor living conditions: respiratory infections, skin infections and diarrhea. Recently there have been more cases of violence and sexual violence, although these may simply have not been reported previously. In the five months after the disaster, 212 patients were treated following sexual violence. The services offered at the clinics are generally basic consultations, ante- and post-natal care, vaccinations, a home visiting feeding program and referral to mental health services or hospital when necessary. There are also still people coming to the clinics who failed to return for follow up care after surgery, who now have infections needing medical attention. Dr Emmanuel Bélimaire divides his time between Delmas 24 and Champ de Mars, one of the largest camps for displaced people in Port-au-Prince. Primary care clinics in both places were established by MSF. “Infections and intestinal parasites are the most common complaints we see. Sometimes we also give guidance on the basics of hygiene because it is necessary for a patient to change their habits. 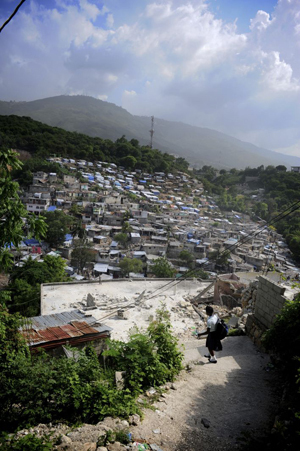 Even before the earthquake, pregnant women in need of maternal health care were at risk in Haiti. The earthquake severely damaged or destroyed up to 60 per cent of health facilities in Haiti, including the old MSF maternity hospital. As a result, MSF started providing support to the Ministry of Health maternity hospital, Isaïe Jeanty, which had not been damaged in the earthquake, providing human resources, drugs and obstetrics expertise. As well as treating pregnant women with medical complications such as eclampsia and malaria, the center offers neo-natal and post-natal services and a blood bank. The latest figures show that MSF helped to deliver 3,752 babies in its facilities. Dr Gessie Delusma is an obstetrician-gynecologist currently working in the Isaïe Jeanty hospital. “Pregnant women were already vulnerable, but now their situation is even worse. They have even less access to health care and health education, and their living conditions are poorer. Mothers who have lost their husbands and other family members live in tents with their children. Those women face great difficulties actually staying in the hospital and delivering. I have always been careful to talk with my patients and to explain to them what is happening. Patients without much education need to be able to understand the information they get. I saw a patient recently who came in with her mother. She presents with a molar pregnancy and needs to be treated, otherwise she could develop cancer. This girl must come back to the hospital for her treatment, so it is crucial that I take the time to explain properly why. Roseline, 34, was five months pregnant when the earthquake struck. She delivered her first baby at the Isaïe Jeanty maternity center in May. “When the earthquake happened I was afraid I would lose the baby as I ran outside the house. I was so scared for him. Afterwards, I talked to the baby inside me and explained to him what happened. The pregnancy went well but the birth was a bit difficult. I had a lot of pain and I needed a c-section. I knew that the services would be free here, that’s why I came. It all finally went well, and here is Angely, my first baby. Haiti lost its only specialized treatment unit for severe burns when MSF’s La Trinité Hospital was destroyed by the earthquake. Re-establishing this unit became a priority, especially given the dangerous living conditions faced by earthquake survivors. By late March, a new dedicated unit had been set up under canvas within the Saint-Louis Hospital compound. The unit includes three tents and thirty beds for severe burn patients, both children and adults. Dr. Rémy Zilliox, a plastic surgeon and burn specialist started working in the burn unit just after it opened. “Burns are increasingly frequent and severe now because lots of people are living in even more dangerous conditions. All aspects of family life take place in just one, often very cramped space: family members sleep, play and cook in the same area.Women and children are often burned because a pot of boiling water or oil tips over, or a candle sets fire to a blanket. Men are mostly burned when handling flammable products, primarily fuel containers. I’ve also seen electrical burns, which are particularly serious. For victims of severe burns, the 24 hours following the accident are crucial. Emergency surgery must be performed within six hours of the accident happening and they require very regular care for three weeks to a month. They are initially treated in the emergency room of the hospital, where specially trained doctors decide whether to set up a resuscitation infusion. Burn patients lose a lot of water, salt and micronutrients. Five year old Walderson suffered third-degree burns to his right leg in April. His mother was cooking in their tent while Walderson was playing with his twin brother. His trousers caught on a pot of boiling water and 12 per cent of his body was scalded. He was admitted to the Saint-Louis burns unit, where he received emergency surgery and remained as an inpatient for over a month. Dealing with the ‘invisible wounds’ – the psychological consequences of the disaster – quickly became a vital part of MSF’s response. Not only were people mourning the death of loved ones, the fear of re-experiencing the earthquake was aroused with every aftershock. Many were also extremely anxious about their own injuries, and were particularly scared of having to lose a limb. MSF started to provide a broad range of mental health support, from group counseling sessions with psychologists to one-on-one consultations with psychiatry professionals for those who developed acute psychiatric distress. 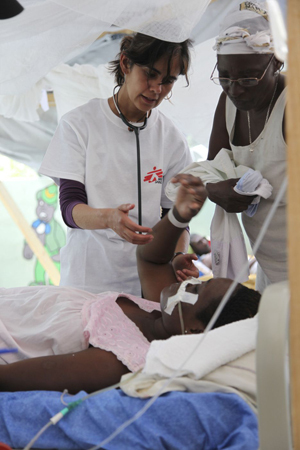 Over the last few months, MSF has given psychological support to more than 80,000 Haitians. Most patients that had individual sessions presented with physical complaints such as cardiac palpitations, pain or flashbacks. By June, psychologists were providing support not only to individuals who were direct victims of the earthquakes but also, increasingly, to those who can no longer bear their dire living conditions. People are extremely anxious about the future, with no hope in sight for an improvement in their lives. Marital, family and socio-economic problems have reappeared and are exacerbated among people who have lost their social standing or who find themselves forced to raise their children alone. MSF offers therapy sessions including relaxation techniques to help reduce anxiety. This strategy works much of the time, but if patients have psychiatric complications, such as mania or delirium, they are referred to a psychiatrist. Before the earthquake, Haiti had only a few facilities that could treat patients with severe psychiatric illnesses. Today there are less than 10 psychiatrists in all of Haiti. There are still only limited opportunities to refer individuals who require hospitalisation and increasing numbers of seriously ill psychiatric patients are today seeking help from MSF. Dr. Maryvonne Bargues, a psychiatrist, leads a 19-person MSF mental health team in Port-au- Prince that includes 13 Haitian psychologists. “Four months after the earthquake, many people remain in what I would call a state of ‘complete confusion of land and body.’ Most of my patients are afraid of being swallowed up by the earth. The earthquake is literally in their body and the noise is always present. They have major sleep disorders. They live in a constant state of fear and continue to have flashbacks. In April alone, I saw 70 patients who were in a state of acute delirium, confused and unable to think clearly. Many have stopped speaking and eating. After two or three weeks of sessions, they improve. There are also people who are grieving deeply and who suffer from depression. Many patients tell me, ‘We will never get through this.’ Living conditions are horrific and many people think that things will not change. Their houses are gone. In the best of circumstances they have a tent, which is almost a luxury. The people in the camps are living in crowded, unsafe and violent conditions. So many people lost almost everything in the quake that the basic needs for survival were very pressing in the first few days. MSF was focussed on the medical and surgical priorities and the first concern for the water and sanitation specialists was to make the hospital areas safe for the patients. That always involves ensuring high standards of cleanliness and waste disposal. But that rapidly expanded to the people who were in the area. Karline Kleijer, one of the emergency managers in Port-au-Prince, says the reaction is instinctive. “You see it because you are working in a hospital in the middle of a big camp and you just have to take care of the people in it.“ At the same time she acknowledges that all of this had to be related to the medical work and the facilities because otherwise all of MSF’s resources would have been diverted away. Outside Port-au-Prince, MSF also started going into some of the small camps and communities and built ‘sanitation areas’ which consisted of a latrine, a shower and a wash area. There were hygiene distributions of soap, toothpaste and toothbrush. Then there were household kits of cooking materials and sheets for shelter and tents. There are still camps with very poor provision and the latest MSF work is in Aviation camp and those around Carrefour Feuilles in the capital, where water and sanitation support is underway. MSF has been significantly involved in shelter delivery but the organisation remains very concerned about the lack of progress overall. It delivered 26,971 tents and over 35,000 hygeine and households kits. Paul Jawor is a water and sanitation specialist who went as part of the emergency team. “Haiti had trouble with water and sanitation before the earthquake, so when the earthquake happened it looked like the perfect storm of disasters all at the same time. Everyone was talking about cholera, which was interesting because there is no cholera in the country! But they did have incredibly bad sanitation issues in the camps. The ‘flying toilets’ as they are called – basically defecating into a plastic bag and throwing them into the waste system was a huge problem because there was no waste collection, so it gets thrown in the lake or into the street. So we made basic cubicles, with a frame and plastic sheeting around the outside and we used a slurry vacuum pump to get the waste out into a 3000 liter tank on a pick-up, which we then drove out of town to the dump area. In the city it was clear that you could get lost among the hundreds of thousands who all needed help. So MSF would do something very simple, which was to put a protractor on the map with its point on the health center that we were working in and I drew a circle. And I said the first people we’re going to influence are within it because these are the people who will be coming to the health center, so it was linked to the medical work. Siliana is one the 45,000 displaced people living in the Golf Club Camp in Port-au-Prince. The earthquake in Haiti on 12 January left immense numbers of people in need of urgent medical care and relief. MSF staged the largest natural disaster response in its history. This table gives some of the key operational data for the period up to 31 May. Following the earthquake, MSF initially developed fundraising activities and the generosity of people around the world in response to the tragedy that befell Haiti has been overwhelming. While the MSF medical relief effort was immediately shaping up to be massive in volume, the total of funds donated to MSF by the public specifically for this emergency threatened to eclipse what MSF could foresee to spend. Striking the right balance so early on was complicated by the fact that it took weeks for the real scale of needs to become clear as well as to gauge what other organizations would bring in terms of practical emergency assistance. MSF takes the expectations of donors seriously and decided to discontinue active fundraising for the victims of the earthquake in the days following the disaster. While MSF continued to welcome donations, pro-active earmarked fundraising for Haiti was put on hold. Instead, MSF called upon donors to continue to support the organization for its current and future emergency work in general. 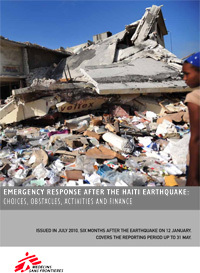 As of 31 May, four-and-a-half months after the earthquake, MSF had received around 91 million euros 1 earmarked for emergency relief in Haiti, and had already spent nearly 53 million euros on assistance to the Haitian population. MSF foresees to spend around 89 million euros in Haiti until the end of the year; remaining earmarked funds will support MSF’s ongoing commitment to the victims of the earthquake in 2011 and beyond. Among the large scope of MSF activities in Haiti, as of May 31, more than 11 million euros have been spent on surgical care for significant numbers of Haitians injured in the earthquake. At least 4 million euros were spent on providing maternal health services, which were already extremely limited before the earthquake struck. Roughly 8.5 million euros 2 were spent on shelter and related items in an attempt to improve living conditions for some of the hundreds of thousands of people whose homes and livelihoods were destroyed. MSF also invested substantial means in other medical and relief activities, including primary care, mental health support, and provision of water and sanitation. Operating such emergency health programs requires a range of investments. Given the devastation in Port-au-Prince and beyond, including the near-total destruction of many health centers and hospitals, nearly 30 per cent of MSF’s expenditures as of 31 May were devoted to logistics, such as the rehabilitation or construction of medical facilities, and ongoing maintenance of health structures including water and electricity provision. Without this investment, medical staff would not be able to operate. A further 16 per cent of MSF’s expenditures have been attributed to medical materials and supplies. MSF is immensely grateful to the millions of people around the world who have helped finance the organization’s massive relief work in Haiti. The broad range of MSF’s work listed above is constantly re-shaped to meet new needs and, in some cases, reduced ones. 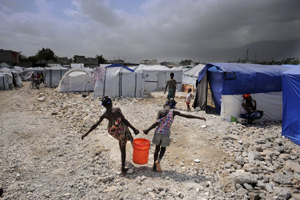 It is already clear that MSF will be making a very substantial commitment to Haiti in the years to come. There are uncertainties around the speed of reconstruction and the extent to which other organizations will still be providing elements of care. There are concerns about the continued physical exposure of so many people in Port-au-Prince and about political and criminal violence which always risks being increased by frustration and despair about the slow improvement in living conditions. All of this has reinforced the urgency of MSF’s planning and provision for all kinds of new emergencies; outbreaks of violence, disease, nutritional crises and further natural disasters. The immediate challenge though for MSF has been to create some more robust medical facilities to replace those damaged in the quake and the tented structures that have coped up to now. In Port-au-Prince, the inflatable hospital known as Saint Louis, along with the Tabarre rehabilitation center, are expected to be replaced with a new hospital next year, that will be an MSF emergency medical and surgical hospital. Martissant hospital will continue into 2011 and Choscal is also likely to operate as an emergency room. Another container hospital in Delmas 33 will be dedicated to obstetric care for the next three years, while support will continue to the Ministry of Health maternity hospital of Isaïe Jeanty. Paediatric care will also continue in 2011 in Carrefour Paediatricand Bicentenaire hospital, which will provide trauma care and surgery too. Primary health care services, including mental health and sexual violence programs will be provided through next year in the deprived Carrefour area and in the new slums of the Airport zone. Outside the capital, MSF will continue to support the hospital in Jacmel with a range of medical specialties through this year, although the hope is that the Ministry of Health will then be able to resume its responsibility there. In Leogane, a container hospital of up to 200 beds will become operational in the next few weeks to replace the current tent structure and until others can provide these services. MSF will work there on obstetrics, surgery and pediatrics. Some caution is warranted regarding the quoted totals as fluctuating exchange rates, mainly between the US dollar and the euro, have impacted the calculated totals in euros. The calculations are based on the average monthly rate for currencies other than the euro. These figures only include the direct costs related to this work; as some investments are shared between a variety of medical activities, the real costs are higher than the quoted totals. These rounded figures, totaling 97 per cent of expenditures, are very close approximations of total expenditures to date.